Our bodies really don't belong to us, they're God's and we have them on loan. God does answer YES to our prayers, not always, but I thank Him for this YES. I have more friends than I ever knew. Challenges can bring a refinement in our faith. Refined faith brings God glory, and that's why He put us here. Being surrounded by men and women of faith is the most uplifting experience of my life. The fight's not over...I hope to learn a lot more. Phil 1:12-14 Now I want to know brethren, that my circumstances have turned out for the greater progress of the gospel, so that my imprisonment in the cause of Christ has become well known throughout the whole praetorian guard and to everyone else, and that most of the brethren, trusting in the Lord because of my imprisonment, have far more courage to speak the word of God without fear. From our side of the computer, each one of you will never know how much your words of encouragement for us kept us strong in the Lord. So many times, we've met or heard of people that read these entries that we don't even know. E-mails have come to us with amazing testimonies of a growing faith. Frank said from the beginning that he wanted God to be glorified through this cancer journey (his "imprisonment" - if you'll allow me the analogy). As we've seen the mercy of God working in our own lives, we have also been witness to God working in yours. We have seen your "courage to speak the word of God without fear". We have hoped that your answered prayers on our behalf have only strengthened each one of you as these last 7 months have strengthened us. The body of Christ is an awesome mystery. I can't wait to see what God will do next, can you? He is still fighting a queasy tummy, but the doctor said that was normal too. We are humbled and grateful that God answered our prayer specifically. He made it through transplant with no infection, minimal side effects and perfect timing - (kids are at camp while he recovers). The main question people are asking is "what now"? Frank still has to complete the protocol for his treatment. There is another transplant in the fall. Then, another year of chemotherapy. After that, there is a maintenance regimen of shots. He'll be followed closely with blood work monthly. The key with Myeloma is keeping it beat down. The treatment isn't over, but as Dr. Weir said today, he's been through the toughest part now. And with God's help, he's done it beautifully. We are looking forward to picking up the kids on Saturday. They haven't heard the news and Frank can't wait to look them each one in the eye and tell them! What a day that will be! Today I was officially declared "in remission" from cancer. Thank you to everyone who has been faithful to pray for me during the past 7 months. Praise God for answering prayers! Give Him thanks! Sing Him a song! Dance a jig! However you feel led, please don't forget to give Him the glory. Peggy and I drove home from Little Rock today. I must say it was one of the best trips I've had in a long while. I'll be recuperating this week, since my white blood cell count is still very low, but man-o-man it is good to be home. More later, but we wanted everyone to know. Well, when you're down, UP is the only place to go. I'm still on the antibiotics for a low grade fever, but the nurses don't seem to be too concerned. I think it's par for the course. There's a light at the end of the tunnel and home is on the horizon. Good morning! We've had a full 3 days. It's hard to believe we've been here as long as we have. We miss our house, dog and cat. (I miss the dog more, but don't tell anyone...especially Chandler). Sunday, Frank's levels had dropped to a new low. His white count was 0.01 and his platelets got done to14. He got a bag of platelets and some IV fluid at the hospital. He ran fever the night before, so we started IV antibiotics right away. He also had pain in his chest. They did 2 x-rays and the doctor came to see him but they couldn't find any reason for his pain. We were very thankful it wasn't fluid on his lungs or anything else. When we went to the doctor Monday, they told him his counts had doubled! We were so thrilled! And then they told us his levels went from 0.01 to 0.02. This is how mentally challenged we are here. They were teasing us all along and we're packing our bags ready to come home!! Yesterday his count was 0.03. Frank and I have made a game out of trying to guess what the next lab value will show. So far, we are both losing. His other counts are still dropping, so it's just a waiting game. Frank's challenge was to beat the record and get out of here by 11 days. He's missed it, but I think God is totally in control. We have met so many people here this time. We have 2 apartments this time - the kids have been in one with g-parents, but the apartments are not next to each other. One is the front while the other's in the back. We have all walked a path going back and forth so many times. Late last night, I was headed over to see the kids and ran into our neighbor - new patient, recent widow. He was feeling really down and hopeless. Mom and I were able to talk to him and encourage him in the Lord and pray for him. Walking away from moments like that strengthen me so much. The night before we heard music from the building next door and thought it was the radio. Turns out it was 3 teenage girls playing the guitar and singing praise music outside the apt. They had just met that day, and both had mothers with Myeloma. Frank is still on the antibiotics and all we have to do now is wait until the white counts get to 2.0. We are getting there - one day at a time. His pain is better but he's still running a fever. His spirits are good. He got up this morning and made himself eggs and biscuits with apple jelly! That's pretty good!! The kids have been here since Sunday and Mom is here this week with us. We've enjoyed swimming and playing with them. I feel so very blessed that I have been able to be with kids both last week and this week. It's a gift we've been given by both our parents and we are so thankful. We continue to thank God for the prayers that are being lifted up for Frank and our family. We feel His presence and see evidence of His grace daily. Our God is an awesome God! Good morning to everyone! I pray that this day has brought a special blessing from the Lord to each of you. Peggy and I have been hanging tough over here. There haven't been a lot of things to post, so we haven't. Each day is filled with waiting on my blood counts to rise or fall, depending on the date after transplant. Yesterday my white blood count was 0.03, which is not good if you're healthy, but desirable for now in the process. When you are cooped up as much a we are there isn't a lot to do. My platelet count is 28, so Peggy won't let me run with scissors. That leaves watching TV, which I had done much of. The highlight for TV this week was the Dateline special about the Tampa, Florida news reporter that has Leukemia. He has 2 small children. 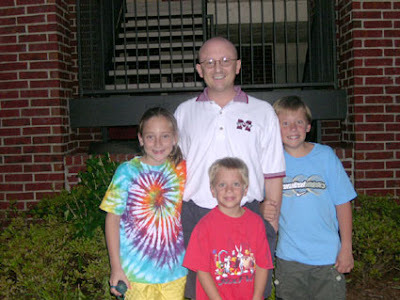 It was a faith story of how his faith, and the miracle of a bone marrow donor put him remission. Peggy and I kept exchanging looks as we found so many similar aspects of our story. So many people were praying for them. Like you are doing for us. We thank the Lord for each of you. Please keep us lifted up. I have started running a fever and having abdominal cramps. We hooked up the IV antibiotic at midnight and called in this morning. These things need to be dealt with, so I am headed back the hospital on what was once my "day off". Also, travel mercies for both our family as the changing of the guard occurs. The kids are coming back to Little Rock today. We'll keep you posted! Have a Blessed Day! It is amazing to me that in the midst of the hardest thing we've ever had to face, we can still have such joy. I know with all my heart that joy is from the Holy Spirit. It's nothing we've done. It's a gift. A wonderful, precious, underserved gift. And I am so thankful. Frank and I have been going to the hospital daily for lab work. Car rides are no fun for Frank. (I'll just leave it at that.) His levels are dropping a little bit, but they're only beginning to fall. His side effects from the chemo are increasing with each day, but he is taking it in stride. Time just won't go fast enough for him. He's "resting" so much and says he's bored. I know that must make the days go by slowly. But his spirits still seem good. Frank's parents and the kids are still here. They all leave tomorrow for Greenville. Even though Frank is sleeping and resting a lot, he says it's a comfort to hear us all in the other room. That's a great feeling. It has been wonderful to have the kids here. We've had fun swimming and riding around the complex with their skateboards. They even play backgammon with daddy when he's awake. Having us together as much as possible has been very important to me and I feel grateful that that has happened. Frank and I will be here together for the weekend, and then the kids come back for another week here with Nana. We are praying we'll be able to go home next week where he can finish recovering in his own bed. We are praying specifically that the side effects will remain minimal...or just go away all together! That he'll remain free from infection. That this transplant will put him in remission! Safety for the kids and travel mercies on them. And that God would continue to be glorified in all we say and do. We talk to many patients every day and pray that we would be sensitive to any opportunity the Lord may put before us. Friday's transplant went very well. The nurse walked in with the - might I say - very little bag of stem cells. 5.5 million cells in that tiny little bag Frank is holding in the picture above. The infusion was over in 4 minutes! The nurse said that all he's been through got us up to this point, and it would be over in 5 minutes. She was right. Frank has been sleeping more and more. The change has been gradual, but you can see the chemicals slowly doing their thing. He did some walking Friday and Saturday, but not today. His tummy is upset and he's fighting off the nausea as best he can. The kids are here in Little Rock now. We met mom in Forrest City for the switch. It was great to hug and kiss on them! Frank's parents are coming tomorrow to help me with them and visit with us. I'm looking forward to a great week. Thanks for all for your continued prayer and encouragement of us. Frank and I pray that each one of you are just as encouraged and growing in faith as you've seen YOUR prayers answered. We are in awe of the mystery of the body of Christ, and power of prayer. Our God is an awesome God. We are praying that God would protect Frank from infection, have minimal side effects and no complications that would slow down this process.